The largest community-owned wind farm project in the UK took an important step towards becoming reality this week, after the trust working on the scheme formally lodged a planning application with Bolsover District Council. Roseland Community Energy Trust announced that it had filed a planning application for the £19m project, which if approved will see six wind turbines erected on a 450-acre site leased from The Chatsworth Estate. Speaking to BusinessGreen, the trust’s director John Hudson said that the group had spent three years developing the plans and engaging with the local community and remained confident that the project can secure planning approval. “We have three factors in our favour: we have good community support for the project, the Localism Bill makes local community benefits a material factor in planning decisions, and changes to planning laws make it more likely that community-owned projects will be consented,” he said. Hudson acknowledged there was some local opposition to the plans, but stressed that as a community-owned project Roseland had a better chance of engaging with critics and would also ensure that the financial benefits that arise from the scheme would go to the entire community, including those opposed to the project. If the project is approved, the trust will seek to raise the £19m of capital it requires from banks and a number of green investment bodies. 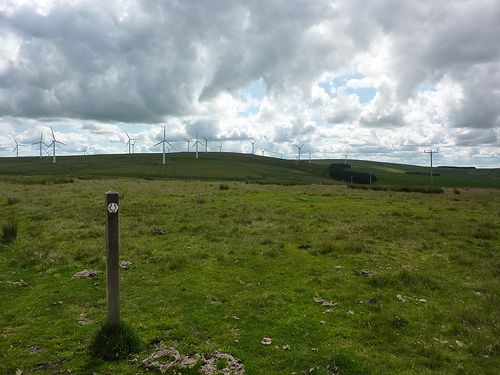 Hudson said early site assessments and negotiations with potential investors and energy purchasers confirmed that the wind farm could generate annual profits of over £750,000 a year, which would then be distributed through a Local Enterprise Organisation and Community Voluntary Partners. The groups have drawn up a plan for utilising the revenue from the wind farm, which could see them provide advisory support for local start-ups, undertake refurbishments of local buildings and facilities, install renewable energy technologies at people’s homes, provide re-training for the unemployed, and fund university places for local children. The Trust is hoping that it can gain planning approval by the end of the year, allowing it to begin construction work and start delivering power and income before the end of 2013. Hudson said that if successful the Trust would aim to provide a template for other community groups to follow, offering advice on how to develop successful plans and raise the capital to support community-owned projects. The Roseland wind farm is the latest in a series of community owned projects to emerge in recent weeks. Earlier this month, the Bristol Energy Co-Operative launched a share issue designed to raise £90,000 for two local solar projects, while a similar £200,000 issue is due to be launched by the Brighton Energy Co-operative next week.